1. In a large bowl, combine warm milk, warm water, sugar and yeast stir until yeast melted. Add remaining ingredients and knead until a ball of dough begins to form. Add more flour if the dough is too sticky. Dust a baking tray with flour. Make balls from the dough and place it on floured tray. 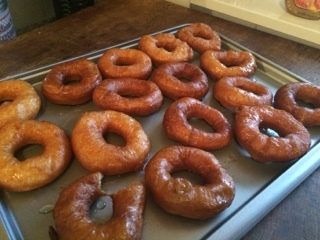 Cover the doughnuts loosely and let them rise in a warm place until almost doubled in size, about 1 hour. 2. Heat oil in a deep fryer or heavy deep pan. 3. Hole the doughnuts with a bottle cap. 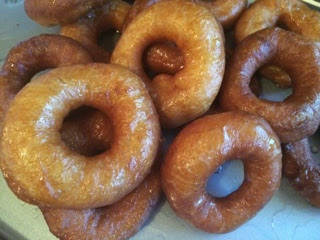 Working in batches, use a slotted metal spoon or spatula to carefully place the doughnuts in the hot oil. Fry, flipping once, until light golden brown, 1 to 2 minutes per side.Transfer as done on a plate covered with paper towels. 4. 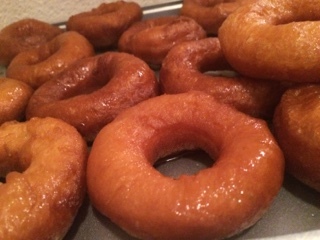 In a small bowl stir honey and water, dip the warm doughnuts into the honey mixture and allow to cool.